Fred Fogarty: the forgotten hero of the land rights struggle. Darwin, the capital of the Northern Territory of Australia, is a city of high rise apartments, busy commuter traffic, military installations and beachside resorts set on an expansive harbor fringed by pastel cliffs and mangrove forests. Amongst these modern developments lies an incongruous 301 hectare area of bushland where the native jungle fowl roam undisturbed and Indigenous picnickers roast shellfish on the coals of their open fires, as their ancestors have done for tens of thousands of years. Twenty-five years ago, deep in this urban forest, the naked body of an Aboriginal man was found on a muddy track. His name was Fred Fogarty. Fred Fogarty came to Darwin from Queensland in 1971, when the city was beginning the rapid expansion that has continued into the twenty-first century. In the 1970s, Indigenous people were being pushed aside by the rapid spread of suburban housing estates to accommodate people from the southern states. Fred was a powerful, intelligent man, who added his intellect and strength to a growing Aboriginal militancy in Australia. The actions of Fred's determined group culminated in the firebombing of a surveyor's truck in 1973 and his eventual incarceration in Darwin's notorious Fannie Bay prison. But not for long. On Christmas Eve in 1974, the raging winds of Cyclone Tracy swept over the town, reducing buildings to ruins and setting Fred free from his cell. Five years later the land that Fred had defended from land speculators was returned to the traditional owners of Darwin. Using the ruins of a city dumped as landfill, Fred and his wife, Violet Adam, built a house on the newly-won land to stand as an example of Fred's belief in Indigenous self-determination and self-reliance. His house became a place of pilgrimage by black and white followers of his ideals until the year he died. One notable visitor was the author Xavier Herbert. The journalist and correspondent for The Times, Stewart Harris, also relates fond memories of an overnight stay with Fred and Violet (Harris 1991:26-27). In Darwin today, Fred's only memorial is the unique urban wilderness that he saved for his people that is once again under threat. The house was built in 1975 from material salvaged from the Ludmilla dump, where Minmarama Village now stands. Fred had a selection of as-new fixtures, after damaged homes were scoped into trucks and dumped into the Ludmilla swamps. On high tides he floated building materials across to a sandy piece of high ground where he built his home. By tapping into a forgotten water main, Fred laid piping to carry scheme water hundreds of meters to showers, flushing toilets and taps that were made available to thirsty fishing and hunting parties from Bagot Community and many other visitors who hold memories of pleasant hours spent yarning in the breeze blowing across the shady verandah. There are many stories about Fred. One involves a plan to build the new NT Parliament House on Emery Point after Cyclone Tracy devastated Darwin. The only problem was a well-advanced Aboriginal land claim to a sacred site on the point, known to the Larrakia people as Goondal. In an attempt to resolve this conflict of interest, the Speaker of the House, Bernie Kilgariff, organised a meeting of stakeholders under a mango tree at the Bagot Community. On the day of the meeting Fred waded along the track through the mangroves to Bagot carrying a heavy knapsack. When Fred arrived, Bernie was addressing an attentive crowd of concerned Aboriginal people, including the residents from the Kulaluk camp. A large map of Emery Point was spread on a table with a model of the proposed building being moved tentatively across the map. 'Will it be alright if we build Parliament House here?' Bernie asked the respectful audience. Interrupting the polite silence, Fred suddenly flung packets of tea, sugar, flour and tobacco across the table with a dramatic flourish. 'You took our land for tea and sugar, now take them back and we will keep our land!' shouted Fred. The spell was broken. In the chaos that followed, Bernie packed up his map and nothing more was ever said about the plan to build Parliament House on Emery Point. It was dark and I had a torch. I found the place in the report about Kulaluk ... and I read the passage out to him ... because I didn't know if Fred could read well enough for himself. It was then that I realized he could, because the torch he was holding carefully followed the words as I read them ... Fred distrusted the idea of leasehold ... It was possible to feel the enormous personal effect of the Woodward Report on this man and, through him, on the tiny motley group of Larrakia people in Darwin. [Galbally] left the judge's chambers 'seething.' The judge's comments were 'outrageous,' he fumed. It wouldn't happen anywhere else in Australia that a trial judge would so blatantly pre­judge the issue and direct Defence accordingly. Galbally then looked Fogarty in the eye and said; 'Fred, you know that there were other part Aboriginal persons there, don't you?' Before a bewildered Fogarty could reply, Galbally said, 'Fred, you know them - you know who they are. There was Jimmy [Bill] Ryan, Bill O'Day [Day], Jackie Smith [Phillips].' At this point Galbally bent forward and, staring Fogarty in the eyes, added: 'Fred, you can say any name you like because no one is going to contradict you. Do you understand?' Fogarty, looking glassy-eyed, nodded, albeit reluctantly. It then occurred to the two lawyers that perhaps their client saw himself as a hero for Aboriginal lands rights, so much so that it was doubtful that he wanted to accede to Galbally's briefing; that perhaps he wanted to be found guilty. There was another problem: Fogarty was too inarticulate to allow him to make an unsworn statement form the dock. Despite the great faith that Fred had in Galbally's abilities, the accused Aboriginal man was too honorable to lay the blame on his mates. Anyone who knew Fred Fogarty would testify that he was a determined, articulate man of strong opinions. In any case, the firebombing incident had been described more typically in Fred's own words in a booklet by Cheryl Buchanan that was published before the trial by the Australian Union of Students (Buchanan 1974). However, Fred agreed to pander to the prejudices of the court and to act as a simple 'blackfella' who was not even present at the scene of the firebombing. Fred's character-acting in the dock was made easier by Galbally's decision to offer no formal evidence from the Defence. Not surprisingly Fred was found guilty, since there was evidence that he had purchased petrol from a nearby service station that morning and left a handwritten note with the attendant to call the NT News. Despite the verdict, Galbally was no doubt happy that he had succeeded in defusing a politically embarrassing trial. I believe that the famous barrister had been asked to go to Darwin by Prime Minister Gough Whitlam for this very purpose. There is no mention of the Fogarty case in Frank Galbally's autobiography, although as a staunch Labor supporter until 1975, at least, Galbally states, 'I had many conversations with Gough Whitlam and like to believe that I may even have been of assistance on one or two occasions' (Galbally 1989:165). Whitlam had good reason to hose down the Kulaluk incident. 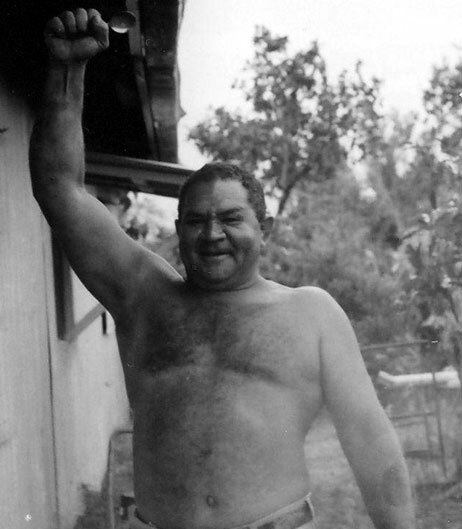 Shortly after the firebombing, he had been confronted by Fred Fogarty and other Aboriginal militants at the Labor Party Conference in Surfers Paradise (Buchanan 1974). On that occasion, Fred's airfare from Darwin and return had been paid for by the Alternative Rhodesian Information Centre in Sydney, at the request of Eddison Zvobgo from the African Council of Zimbabwe (Tribune July 17-23, 1973). We talk about Fred's trial and he tells me that of course he lied about not throwing the bomb. The jury also knew he was lying, but he wanted to give them a chance to deal gently with him, because he realized that it was a criminal trial and not a political one. And he didn't want to be put away for years. Frank Galbally also knew he was lying, of course, and didn't see any other way. Bill and others in the south has wanted Fred to be a political hero and tell the truth. 'Bugger that,' said Fred - and he knew the criminal law OK having once been on an 'attempted murder' charge. Knowing Fred's contrary nature, in my opinion in the above conversation with Stewart Harris, Fred was rationalising the influence that he allowed Frank Galbally to have on his trial, although Fred was certainly no starry eyed idealist. The pictures over the weekend were beauties again, Where Eagles Dare. It started slow then the action really warmed up. Clint Eastwood for America and Richard Burton for England wiped out the whole German race. Dead whites everywhere. Burton suffered a corn on his trigger finger and Eastwood a scratch on his hand. (quoted in Bunji, page 68). Fred's belief in violence as a solution is well illustrated by the true story of the butterfly catcher. On this occasion Fred came upon a man on a bicycle on one of the Kulaluk tracks, carrying a butterfly net. 'What are you doing on our land? Leave our butterflies alone!' Fred yelled angrily. Apparently the terrified butterfly catcher was forced to flee from the land with Fred in pursuit. His bicycle was wrecked. Ken White claims Fogarty was 'drowned ... not long after Cyclone Tracy.' In fact, Fred lived for another ten years at his magnificent home in the mangroves. His sudden death at the age of 53 on March 31st, 1985, remains a mystery. Women from the Bagot Community returning from gathering yams in the monsoon forest found his naked body lying in the mud on the track near his house. Suspicions were further aroused by the callous actions of the Kulaluk management in vandalising Fred's house to make it unlivable while his body lay in the Darwin morgue, and later totally flattening the remaining structure. Plans to give Fred a funeral in Darwin deserving of a land rights hero were thwarted when relatives claimed his body to bury him in the cemetery at Dalby, in Queensland. Because Fred was deeply committed to Kulaluk and the Northern Territory and rarely spoke of his Queensland relatives, this final action was also interpreted by many as government-sponsored interference to eliminate a potential problem. Buchanan, Cheryl 1974 We have bugger all: the Kulaluk Story. Melbourne: Australian Union of Students. Victoria: Penguin Books. Harris, Stewart 1991 Foreword to Bunji (Unedited Version). Braidwood, New South Wales. 30pp. White, Ken 2005 True stories of the Top End. Indra Publishing, PO Box 7, Briar Hill, Victoria 3088.